With all the heat and humidity out there, we’ve been going through juice, sports drinks, and other beverages like they’re going out of style. I recently stocked the fridge with an assortment of Lo Fruit Beverages. LO is a low sugar, and low carb fruit beverage that tastes great. This is a great product for those who are health conscious or have dietary restrictions. It is naturally sweetened with Stevia, and it contains ActiVin®, an all-natural Red Grape Seed Extract rich in polyphenols – powerful plant-based antioxidants called proanthocyanidins. One ten ounce serving of LO contains the same amount of calories (35 – 45), carbs (8 – 11 grams), and sugars (7 – 10 grams) as found in one whole fruit. Additionally, LO Fruit Beverage is a certified low GI (glycemic index) product, as clinically test by Glycemic Index Laboratories, kosher, vegan, and gluten free. 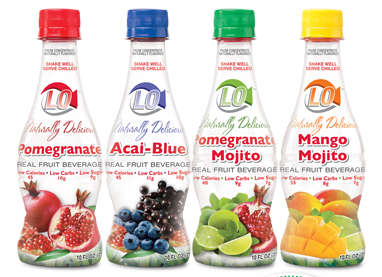 LO comes in great flavors like Mango Mojito, Pomegranate Mojito, Acai-Blue, and Pomegranate. I think I like the Acai-Blue the best! These can be purchased in packs of 4 and 12. And you can choose packages with the individual flavors or choose a mix of flavors. My favorite thing about the product is its versatility. The product may be enjoyed as a cool drink straight out of the bottle, or you may also use it as a mixer for smoothies, and even cocktails! You can place your order for Lo Fruit Beverages on their website, or look for the product on Amazon.